Dr. Bob Bentley has been a successful chiropractic practitioner since 1998. His Farmington practice welcomes people of all ages and from all walks of life, and his expertise in the field of health care is unsurpassed. 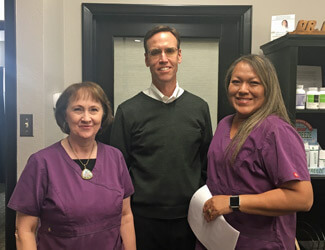 Because he’s been a longtime chiropractic patient himself, he has firsthand knowledge when it comes to the many benefits associated with his profession; he’s ready to help. Our mission is to help those we serve understand where true health comes from, and share that message with as many people as possible. Over the years our passion for chiropractic has evolved tremendously. Many patients initially come to our office believing chiropractic adjustments are only about eliminating their pain. And it does do that. However, over time it becomes clear to them that chiropractic care is about far more than the relief of suffering; it’s about the achievement of overall wellness. It optimizes the wellness potential of everyone that receives it on a consistent basis. It’s the gift that maintains maximized function in the body. The power of the human body to heal itself is amazing once the spine is aligned correctly and nerve interference is removed. May we help? Bentley Chiropractic urges you to contact our office today; we accept insurance and offer free consultations.